Beginning next week, Copywrite, Ink. will be releasing mini-histories and case studies celebrating 15 years of communication excellence. The downloadable pdf portfolio pages will be accessible on Copywrite, Ink. 's main website: copywriteink.com (where we've been). Each week, we'll release a new portfolio page, featuring a specific industry. The image (right) is a preliminary design draft featuring automotive experience before the history was written. Since 1991, Copywrite, Ink. has worked on agency accounts that include The Auto Collection (at The Imperial Palace Hotel & Casino), BMW Performance, and Black Hawk Expositions. In addition, we've developed campaigns for a variety of dealerships, including Cadillac, Lincoln, Mercury, Saab, Subaru, and Volkswagen. 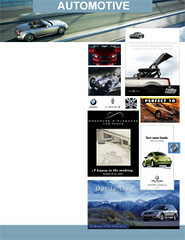 Recently, we developed the strategic communication and creative direction for Concours d'Elegance Las Vegas. The pdf portfolio also provides a glimpse of our what our future site will look like in the months ahead. The new site design will be rolled out in three phases: the addition of these pdf portfolio pages, back lot merchandise featuring our Hun Productions brand, and then an image overhaul for the site to bring everything together. Currently, you can download a pdf list of select account experience as well as a list of our award winning work. In total, we have experience on more than 1,000 agency accounts.